Mother has developped a crazy obsession with the Korean show My Lovely Sanshun. I mean I don't mind watching it and all, but I'm just as happy online? Mother: Help me recap some of the important parts of last week's episode. Mother: Did he say "don't go" BEFORE or AFTER kissing her? SONIA MAO refuses to answer me about the (A) and (B) thing, she says it's dumb. I bet she secretly ran for paper to list the pros and cons. 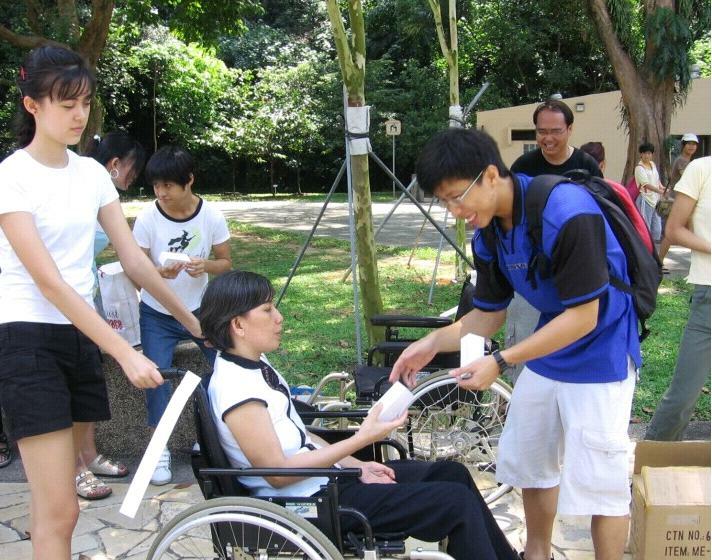 Did this volunteering thing for the disabled, I got an old lady who's sane at least, she suffered from a disease at the age of 12 that left her handicapped. She only spoke Chinese, but I CAN UNDERSTAND enough to comprehend "too hot", "need to wash hands first"..etc okay! It was totally BACKBREAKING though, pushing the wheelchair up a slope, and when going down having to go backwards to act as a human stopper.